We often forget, as the more mature adults we consider ourselves to be, to think of the little ones. The children who so heavily rely on our understanding of the world, when we ourselves minimally question our behaviors but defend adamantly with a stubborn confidence. But how much of our claim of protecting children is actually true? Does our empathy have a limit? As apathetic as it may sound, the answer is a resounding yes. And despite the constant flow of images, the horrid news stories, and persistent virtual exposure, humans seem to have little empathy for the masses. This behavior eases the imposition of harsh “resolutions” from politicians and civilians alike to fix the problem of removing refugees, deporting families, denying asylum, ethnical cleansing, bombing countries, and creating famines. The answer is psychic numbing. Led by psychologist Paul Slovic, the research results on psychic numbing can be grim. How much is too much for human compansion or at the least, attention that leads to action? I’ve been doing research on risk for close to 60 years now. [In the 1970s] I was struck with Daniel Kahneman and Amos Tversky’s work on prospect theory. It had something called a value function in it, which indicated how people value things as the amounts increased. Changes at small levels had a big impact, and then as the magnitudes got larger, it took more and more of a difference to be noticeable. The difference between, say, $0 and $100 feels greater than the difference between $100 and $200. If you’re talking about $5,800 or $5,900 — [both] seem the same, even though it’s still $100 difference. I talked with Tversky about that, and [wondered] if that applied to lives. We both figured it would — and that this is really a pretty scary kind of thing. It means that there is no constant value for a human life, that the value of a single life diminishes against the backdrop of a larger tragedy. Is this what you call psychic numbing? The larger number of people, the more apathy. Yes. And the opposite side of that is something we call the singularity effect, which is an individual life is very valued. We all go to great lengths to protect a single individual or to rescue someone in distress, but then as the numbers increase, we don’t respond proportionally to that. People care about individuals. We see it over and over again: There’s a child who needs an operation, his parents can’t afford to pay for this operation, and there’s a story in the newspaper. An outpouring of money donations and support is often tremendous. We do care a lot about individuals. We don’t scale that up, even when we’re capable. We’re compelled to help individuals. But the world’s problems are too large to be solved one person at a time. Individual stories and individual photographs can be effective for a while. They capture our attention — they get us to see the reality, to glimpse the reality at a scale we can understand and connect to emotionally. But then there has to be somewhere to go with it. 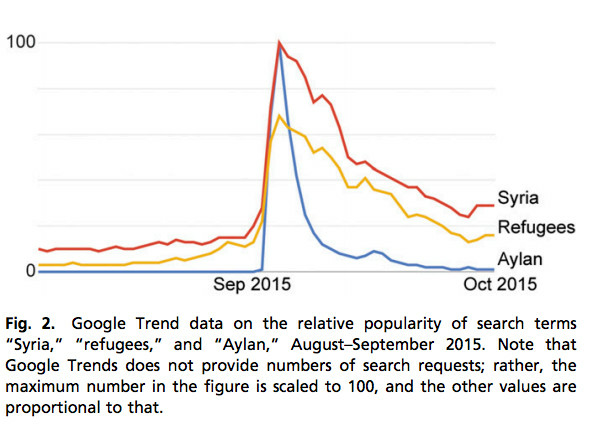 We did a study not too long ago; it was in Proceedings of the National Academy of Sciences, about Aylan [Kurdi], the little [drowned Syrian] boy on the beach. We analyzed the reaction to that photograph. Since 2011, the … death toll in Syria was relentlessly climbing to hundreds of thousands. Suddenly we see this little boy washed up on the beach, and it woke people up. People suddenly started to care about the Syrian war and the refugees, in ways that the statistics of hundreds of thousands of deaths had not led them to pay attention to. Then we were able to track that, and that lasted roughly a month. There were things people could do. In Sweden, where they had taken in 160,000 Syrian refugees, the Swedish Red Cross had created a fund to get money to help take care of this mass influx. The day after that photograph appeared, donations went from $8,000 to $430,000 — because of the photograph. Then we could see over time how … it stayed elevated for about a month or so, and then it went back [down]. These dramatic stories of individuals or photographs give us a window of opportunity where we’re suddenly awake and not numbed, and we want to do something. If there’s something we can do, like donate to the Red Cross, people will do it. But then if there’s nothing else they can do, then over time that gets turned off again. These [individual] stories are important, and they can be very effective. But [only] if there’s an action that can be taken, then, while you’re engaged. The article continues and I highly recommend you finish reading it. And the truth of the matter is that during situations of dire distress and inhumanity, children suffer the most because of their inability to fully conceptualize a situation that is beyond their cognitive formation, later cascading into a series of lifelong traumas. Since humans are often programmed to react in certain ways, is it up to our subconscious or mind to combat our ingrained behaviors. This is what makes us humans, our morals, our compassion, the necessity to help one another. It is one of the main reasons why humans have survived as a species! Now that you may feel compelled to help, you begin to question yourself your perceived inability to help. The most immediate aid is donating to a cause, but if money isn’t easily accessible to you, donate your time. Volunteer locally or internationally (you would be surprised the number of organizations that are willing to fund your expenses in exchange for your volunteering). And if time is too precious to give away, speak up. Use your voice to represent and speak out for those in need, spread the word so that it can reach someone who can help more directly. In order to assure ourselves a prosperous future, we must protect our children. Because no human has more value than the next one and geographic distances are simply just excuses. Think about it, in the United States we would never imagine putting our children through multiple episodes of bombings, so why must Syrian children endure the explosions? A child’s life on one side of the Earth holds the same value as a life sitting right next to us. Keep repeating that to yourself. Want to donate? The following are trusted friends who have created venues for you to help them aid children.